Uncategories Widespread GM AC condenser causes discussed : 2014-2015 1500 Silverado, 1500 Sierra, Tahoe, Suburban, and Yukon. The OE condenser and OE A/C system is/has been experiencing warranty issues in the field on the 2014-2015 Silverado 1500, Sierra 1500, Tahoe, Suburban, and Yukon models. The OE discharge hose assembly develops a hole over time in the sharp 90o bend just after the refrigerant muffler in the line before the condenser (see image below). This 90o bend after the muffler, but before the condenser, in the inlet hose assembly which attaches to the condenser; discharges refrigerant from the muffler and causes the bend to erode/corrode, especially since the pipe material is thinner at this bend. This hole, when it occurs, causes the refrigerant to catastrophically release from the A/C system in a very short time. A GM dealership confirmed to us that GM made a design change after 2015 to the hose assembly configuration so that the bend is not so sharp. The dealership also indicated to us that the model years effected are 2014 and 2015 only. Furthermore, the reason for the increase in condenser replacement sales is that when the refrigerant leaks, the compressor can fail. When the compressor fails, good installers will always replace the components upstream from the compressor as well as the compressor itself. Since the condenser is upstream, the condenser often gets switched out as well. 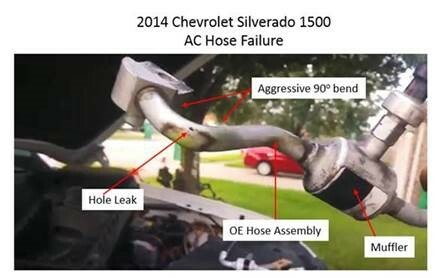 The applications that were affected by this hose assembly design flaw were the 2014-2015 1500 Silverado, 1500 Sierra, Tahoe, Suburban, and Yukon. The link below shows how the interface between the GM OE receiver/drier and OE manifold on the OE condenser is very small. This type of joint is not able to withstand excessive impact forces or fatigue. 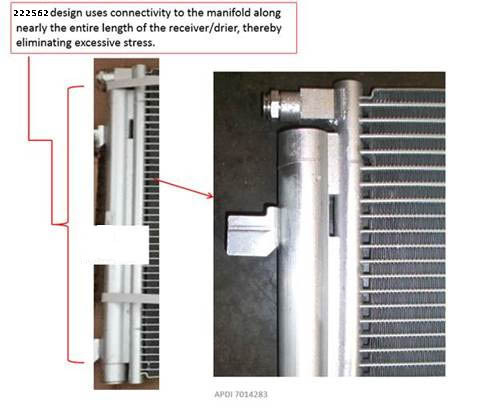 The interface on Radiator Express' condenser, however, is along nearly the entire length of the receiver/drier (see image below), thus attenuating stresses and strain. By designing our condenser with a long manifold-to-receiver interface, we have completely eliminated any high stresses that are prevalent on the original equipment.